When your corporate name is "in the lights" by sponsoring the 2018 UMGEOCON, your marketing team is making good things happen. Add in an exhibit hall booth and it's win-win-win. The deal is often best sealed when attendees have a chance to chat in a relaxed environment. Everyone realizes that, and sponsors are deeply appreciated for making that possible for all who attend. In 2016, UMGEOCON raised over $18,000 for scholarship programs of the participating associations. 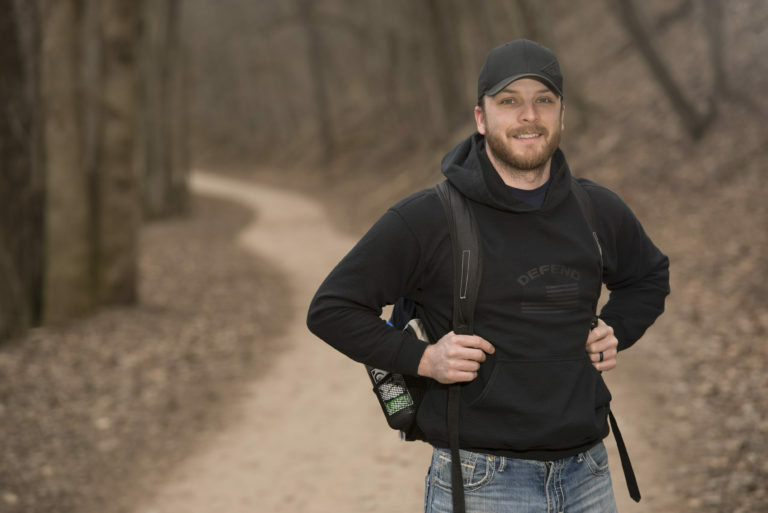 One of those who received a $1,000 scholarship through GITA was Scott Nesbit, University of Wisconsin - Eau Claire. Any profit made at UMGEOCOM is divided equally among the 7 host nonprofit organizations and returned to the geospatial community through scholarships and similar charitable programs! In 2016, UMGEOCON sent over $18,000 back to the greater community through these programs. Help us make 2018 even better! 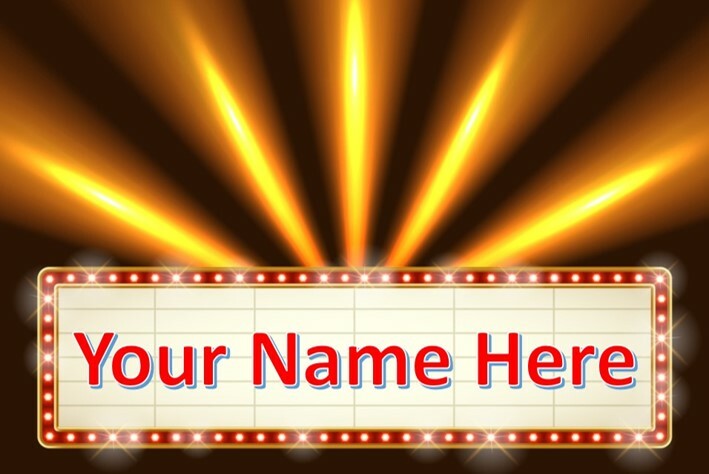 Although the cut-off for Sponsors to be listed in the onsite program was May 16, UMGEOCON will recognize any sponsor who contributes up until close of business on Tuesday, May 22 through official mention at opening ceremonies and other online and onsite advertising. Simply review options below and purchase a package without a cutoff date using the button below. No one knows your marketing needs like you do. Any item below can be bought individually, in multiples to achieve exclusivity, or bundled across types to suit your needs. A summary table of available options is immediately below. Details for each opportunity can be found by clicking open the respective tab below the table, or by downloading and reviewing the event sponsorship prospectus available by clicking here. Extended Advertising and Display of Sponsor and Vendor Point of Contact Information: All vendors and sponsors of UMGEOCON receive an informational listing on the UMGEOCON post-event website which will remain available online for a minimum of one year. The site for 2016 has been active since June of that year. Open to Other Sponsor and Vendor Offers: Are you a potential sponsor or vendor and have other ideas about how you could contribute to making UMGEOCON an amazing event? We are open to that possibility, so send us an email at: umgeoconsv@gmail.com. Get Noticed as the Hostess with the Mostest! Everyone wants to be the BIG CHEESE. Here is your chance. 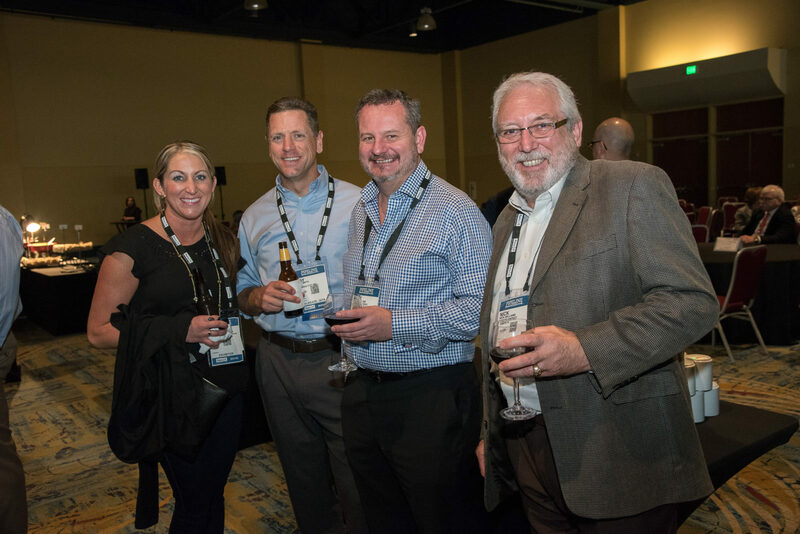 Make your presence known at the evening reception for UMGEOCON attendees. Your logo will be prominently displayed near the serving stations for all to see. Certain to create a lasting impression! Your Logo Around Everyone’s Neck for the Entire Conference! Every attendee at the UMGEOCON Conference must wear a badge during the two days of this event. Keep your company logo front and center by providing lanyards with your logo to be worn by all participants. In addition, your company logo is prominently displayed at the event registration counter. You will be Seen as the Conference’s Educational Champion! Nothing communicates like a logo on the speaker’s podium. Indeed, little doubt who the President of the United States is with the Presidential Seal clearly visible with every word spoken. So, make the leap to the BIG TIME, in a BIG WAY, by having your corporate logo prominently displayed on the keynote speaker’s podium during one of the two keynote presentation slots. Let’s be honest. More than a few folks will be noticing they are a bit rough around the edges at the start of day two. That’s where you come to the rescue by providing a nourishing and recharging continental breakfast that will turn the biggest grump into a friendly go-getter ready to learn. Your logo will be prominently displayed near the serving stations for all to see. Certain to make all who partake realize you are the HERO of Day Two! After all this learning, one last chance for attendees to network and notice you are the one sending them home with a full tummy – and what could be better than that? Your logo will be prominently displayed near the serving stations for all to see. Certain to leave a lasting impression! Company logo on signage in proximity to buffet line. If you want to make sure attendees know about your great products and services, here’s an opportunity you won’t want to miss! The popup floor banner you provide will be displayed outside the entrance to the conference breakout rooms. Opportunity to display sponsor provided popup floor banner outside an event breakout room during both days of the conference. An Eblast advertising opportunity ONLY available to attendees of UMGEOCON! Promote YOUR product or service to build interest and awareness so you can jump start your in-person networking efforts! One email blast to conference attendees. 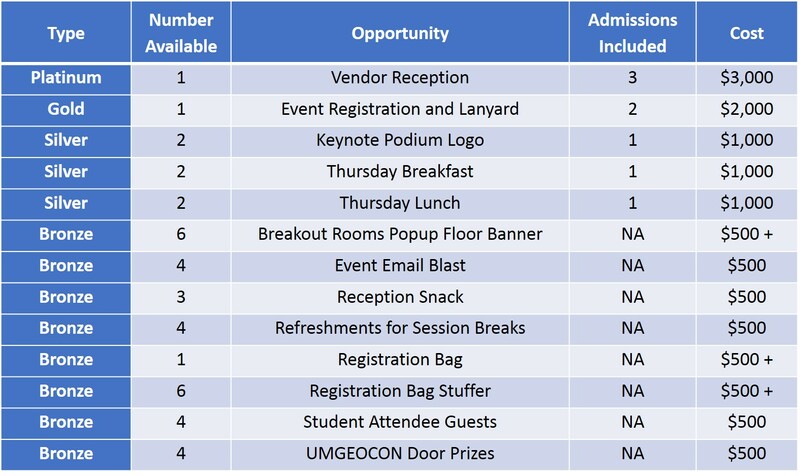 Be the first to welcome attendees to UMGEOCON with refreshments placed in the registration area that will quench the thirst of weary travelers and provide sustenance to the attendee running so late they don’t have a chance to grab lunch. You will make a memorable and lasting impression. In addition to the generic Bronze items of recognition listed in header of this section, this sponsorship adds the following specific item: Signage placed in proximity to the refreshments noting your sponsorship. With the sheer amount of education and discussion taking place, it’s only right that Conference attendees are given a break on occasion. Be a bastion of relief by providing attendees with refreshments during session breaks. Cheers! Signage placed in proximity to the refreshments noting your sponsorship. Your company logo, along with the conference logo, is prominently displayed and seen throughout the conference when registered attendees carry their event bag to exhibits, session and other events! If the simple and economical plastic shopping bag style is not your bag, then go for a long-lasting impression with a product designed for continual use, even when the conference is over. Your corporate logo, emblazoned on the event bag, placed in the hands of every event attendee. Everybody loves swag! There is nothing more fun after registering and receiving your event bag than digging through it for the amazing treasures it holds! Don’t miss out on this opportunity for your logo to be one of the first impressions attendees have! Help a starving college student! Each of these sponsorships will be used to help FOUR (4) deserving students attend UMGEOCON as your guest. In addition, $250 of your sponsorship will be earmarked for regional scholarship programs. This act of generosity will not go unnoticed – we guarantee it. Admission for FOUR (4) full-time college student in need of financial assistance to attendee UMGEOCON. You can't have a party without some door prizes! So, here's an opportunity for a sponsor to be the point of focus as everyone waits to find out who the winners are during the UMGEOCON closing event. Opportunity to speak to attendees of the Southwest Social for up to 2 minutes prior to drawing a name of door prize winner. To hold down costs, sponsorship payments are made online using a credit card. After registering to use the UW-L online payment system, make your selection and provide your credit card information. Sponsorships are assigned first-come-first-served upon payment. Payment is due in full before the associated item will be assigned. Refunds. UMGEOCON reserves the right to cancel a sponsorship if payment has not been made by the agreed due date. If a sponsorship is cancelled, UMGEOCON retains the right to all deposits.